Oh, Meryl Streep. You are indeed the greatest actress alive. You can do serious movie roles like The Hours’ Clarissa Vaughan and break our hearts. You can do campy comedic roles like The Devil Wears Prada’s Miranda Priestly and receive an Oscar nomination. Then you can sing your heart out as Donna in the feature film adaptation of the adored musical that has been seen by more than 30 million people around the world. 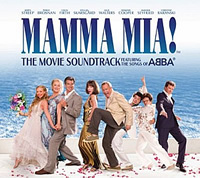 In this movie soundtrack featuring the beloved tunes of popular Swedish pop group ABBA (we have no idea how to reverse the first “B” so that it is identical to the official band logo), we get 69 jolly minutes of familiar tunes that will have you singing along. Not a bad remedy for a gloomy day at work, we’d say. Academy Award winner Streep leads an all star cast in this album to cast away those depressing feelings. Join Donna and her fun loving girlfriends Rosie (acclaimed English actress Julie Walters) and Tanya (Golden Globe nominee Christine Baranski) as they belt out how “Money, Money, Money” is “always sunny in a rich man’s world”. In “Dancing Queen”, the lovely trio invites us to take a trip down memory lane and “feel the beat from the tambourine”. What fun! In more tender moments like “Our Last Summer”, Bill (Stellan “Bootstrap Bill” Skarsgard), Sam (Pierce “James Bond” Brosnan) and Harry (Colin “Mark Darcy” Firth) reminisce with Donna how they “took a chance like we were dancing our last dance”. Then immerse in the romantic “When All Is Said And Done”, where Sam and Donna sing to each other about how lovely it is to be “standing calmly at the crossroads, no desire run”. Round up the experience with Sophie (newcomer Amander Seyfried) soothingly singing the hopeful “I Have A Dream”.